In my last post, I answered some questions about how I practice. Here are a few more tips, advice I give to my current piano students. 1. Warm up for 10 to 14 minutes using the scales and practice patterns I mentioned in my previous post. 2. Play through your learned material one time so you won’t forget the tunes you’ve already worked so incredibly hard on. Pretend your practice time is a gig. That way you won’t forget your tunes. After all, you’ve done so much work to get them up to speed. Of course, that can take a while if you have 25 tunes. So choose a different set to run through each day – five tunes for example. 3. I usually assign students two to three standards to work on. I ask them to play the standards four different ways, because as a pianist, you need to be able to successfully play these four ways. Depending on the gig, you’ll choose one of the four. 4. In addition to the standards, I also assign a transcription. When we work on a transcription, we first just have to get the notes right. Sometimes that takes a while, so be patient. Take it line by line, then section by section. Find your trouble spots, and don’t continue until you’ve worked it out. 5. Then we go back and study the dynamics, the comping, and the touch of how the artist approached the solo. For example, working on a Bill Evans solo is very complex because of Bill’s inner voices in his left hand. 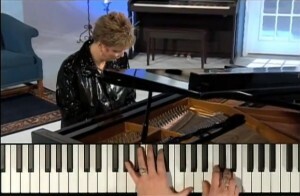 His touch was extraordinary and passionate due to his intense study of classical music. He learned to balance his solos and the complex voicings of chords from his teacher Madam Chaloff. She was an expert at teaching control and touch and playing beauty. I hope you these tips will help you enjoy the practice of practicing and will make you a better, more confident musician. Happy practicing!